On Wednesday night, I went out to shoot some shooting stars. I headed back to the spot I shot the Leonids from not too long ago, though that trip only yielded a few meteors and lots of lens condensation. Conditions were much better this time and I came prepared. First, it was cold out. the Forecast originally said about 51 degrees. When I got out there, it was 42 and falling. This also meant that the chances of lens condensation went way up. The camera would hit the dew point fast. To combat this, I made lens warmers. I had one camera pointing towards the southeast, which was the preferred direction for shooting. This one was set to shoot continuously. The other camera was pointed northeast. I let that one fire away for about 15 minutes and then would stop it to check the lens for dew. The lens warmers worked amazingly well. Everything else was getting wet, but the lenses were warm and dry. The camera pointed to the northeast only captured a few faint meteors. The best shot was the one up top. But it did capture something interesting. When I was checking the lens, I fumbled with the flashlight for a second and it ended up pointing out into the void of the Florida wilderness. When turned around and started the camera back up, there was a flashlight pointing back at me. Freaky. I was on the very edge of a state park. Upon checking when I got home, it turns out there are camping spots over there. As I mentioned, the real action was to the southeast. These are the three biggest ones I got shots of. 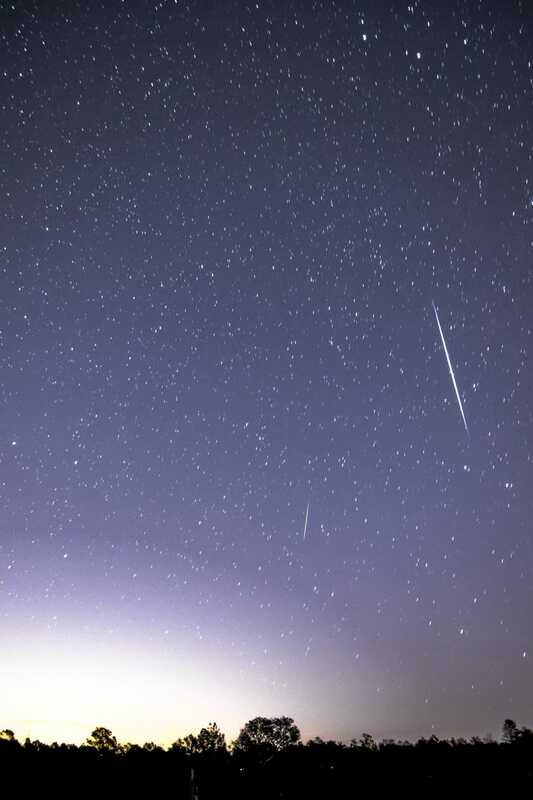 For most of the time I was sitting out there, I was seeing about three meteors per minute. It was simply spectacular. After mucking around getting set up and taking test shots, I was able to get 200 continuous 30-second shots off from the southeast camera before the battery was too low to continue. I stacked those 200 shots together. I had extra batteries, but I had been out for three hours and it was getting colder, so I packed it up. I know it is literally a year away, but if you can catch the Geminids next year, please do. The moon will set just after 11 pm on the 13th, which is peak night. That’s the best time to start watching. I know it’s cold, but it’s totally worth it.